When it comes to modifying your ride, everyone has their own specific tastes. As a fan of both American muscle and the flared fender movement coming out of Japan I have an appreciation for both genres. I like the energy of the underground pop culture and the crazy stanced and cambered out look that comes along with that culture. At the same time I have much respect for the old school vintage vibe and grit of hot rods, muscle cars and burning rubber. With that said, you would think that I would absolutely love seeing the blended style and tradition come together. A combination like that should create something menacing, aesthetically pleasing and just straight badass; but it doesn’t at least not in the case of the new Dodge Challenger SRT Hellcat. The fender kits and lowered stance looks right at home on the Ferrari 458, Nissan GT-R, BMW’s and several Porsche models that I have seen. 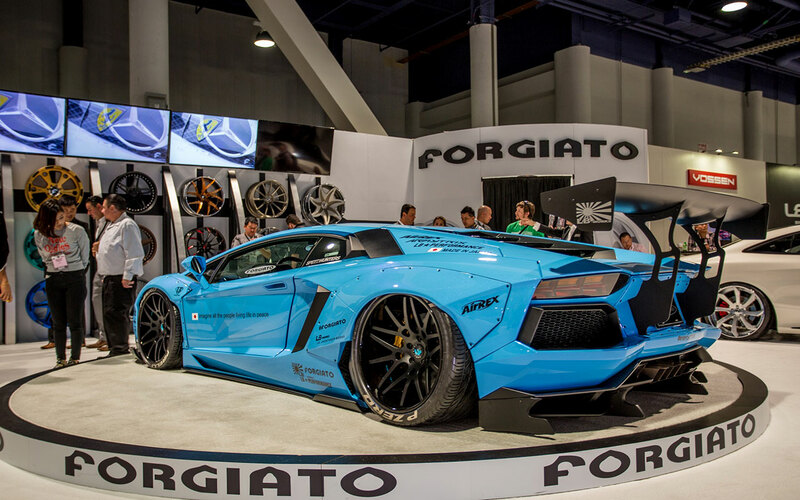 Take for instance this Lamborghini Aventador, I love the bolted widebody kit, the Forgiatto wheels and that belly scraping suspension. On the other hand, I’m not so sure about the similar combination on the Challenger SRT Hellcat. The bolt-on exaggerated style cues looks great on the Lamborghini but a little abnormal on the Dodge. I know it is contradictory but when I heard about this car and saw the pictures my first impression was that I liked it. But after taking a closer look from different angles, I had to be honest with myself and admit that it’s not exactly lighting the woods on fire for me. I applaud the effort of the all-star team in pulling this build together. There is a lot to be said about the workmanship and professional expertise required to even install a kit like this. Thumbs up to everyone involved. It’s weird because I love each individual component of this vehicle, from the deep dish wheels, to the flared fenders and lowered air suspension and of course the beastly Dodge Challenger; I am just not convinced that these components properly gel together on the Hellcat. The SRT Challenger has an aggressive supercharged 6.2-liter V-8 with 707 horsepower and enough torque to pull a train, but it looks to be out of its element with this particular kit combination. Is it just me, or does the LB widebody kit look great on every other car except for the Dodge Challenger Hellcat?